I say "po-ta-to", but you can call 'em anything you want! 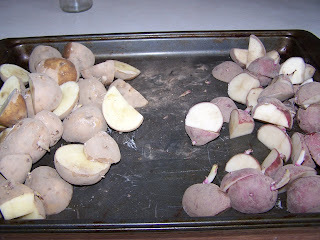 The taters on the left are the Yukon Gold variety, and those on the right are Red Norlands. Kinda looks like the nasty stuff at the bottom of the potato bag, doesn't it??? Like I should be composting them instead of planting them!! I have never planted potatoes before, and didn't have a clue as to how to go about this, so I checked a couple of my gardening books and called Parisienne Farmgirl for advice. P.F. had no tater advice, as she has never planted them either, but we DID have a nice long chat about lots of other gardening stuff, as well as catching up on family matters! So, Carly Emery's "Encyclopedia of Country Living" had plenty of dirt on potato planting, so I am out this morning trying yet another new thing! I have loads of extra space in my perennial beds, as we have lost a lot of plants the last 2 harsh winters. And, of course, the bunnies did some major damage to some roses and made off with all of the tulip and daffodil bulbs. So, instead of spending $$$ we don't have on annuals to fill in the blank spots, I spent all of $2.00 and bought 2 1/2 lbs. of seed taters! They will be planted willy-nilly, as we have pockets of space here and there, but I think with a popsicle stick marker, we should be OK! Anyone else trying something new in their garden this year? We tried onions last year, for the first time, and they lasted almost all winter long...so we're doing that again. I think a person should try at least one new thing per year. Eggplant was another experiment, but since no one but me liked them, we scratched that for this year. I like your idea for planting them in the beds...smart use of space! Let us know what you learn! My goal next year is to raise potatoes for winter storage. I have no clue. None. Na-da. lol. Hello... on this overcast (sun-trying-to-come-out) Thursday! Hello! What a fun farmgirl blog you have! Really enjoyed my visit here! Congrates on winner sweet Cat's giveaway! What fun things you have coming your way! May I say that you are one inspiring lady. I've been away for the last couple of days and when I arrived home I read your last few post. Firstly, your grandson may be away for the moment but he will never forget what you have done for him and he will eventually make contact on his own. For this I will pray for you. Planting it forward is such a good thing to do also especially when so many are having hardship. And potatoes are such a great staple and when they grow they have pretty little flowers as well.Thankyou for your wonderful posts. Here, in Tazewell County, VA, Burke's Garden got its name when James Burke left potatoe peelings during a game hunt. This was in the 1700's or thereabouts. When the hunting party returned the next year, Burke found potatoes ready to be plucked, cooked and eaten so "God's Thumbprint" is also known as Burke's Garden. We like growing potatoes. They are super fun to dig up. Like a present underground! We tried okra last year and that turned out well. I don't know what we will try new this year. Something yummy to eat. Hi-not trying anything new in my garden....I have plenty the way it is!! We plant potatoes all the time...if you have a question please feel free to ask away! Howdy~I am planning on planting some red potatos and sweet potatoes in the next couple weeks (I'll have pics up soon as to why...garden building) I have no idea about them and will be anxiously waiting to hear how yours are coming along. Any tips? They are going into a 12 inch deep raised bed. Another thought...did you catch the recent post regarding potatoes from The Holy Experience? Quite touching! My MIL plants potatoes (she has to, she lives in Idaho) and they are DELICIOUS!